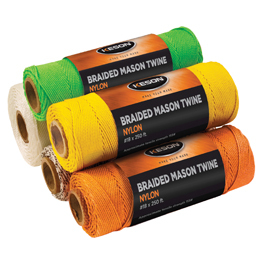 Braided mason twine doesn’t come apart even when reused. It is perfect for large jobs and everyday use. You can also nick it with a trowel and it won’t unwind. Another benefit is that braided mason line does not spin as much as a twisted line, bringing plumb bobs to rest sooner. 18-gauge line with an approximate tensile strength of 155 pounds. 250 feet = 1/4 pound, 500 feet = 1/2 pound, 1000 feet = 1 pound. BWB250 020478 black & white 250 ft.
BWB500 020485 black & white 500 ft.
BWB1000 020492 black & white 1000 ft.
GB250 008278 green 250 ft.
GB500 008285 green 500 ft.
GB1000 008292 green 1000 ft.
OB250 008216 orange 250 ft.
OB500 008223 orange 500 ft.
OB1000 008230 orange 1000 ft.
PB250 008247 pink 250 ft.
PB500 008254 pink 500 ft.
PB1000 008261 pink 1000 ft.
WB250 108152 white 250 ft.
WB500 108169 white 500 ft.
WB1000 108176 white 1000 ft.
YB250 108183 yellow 250 ft.
YB500 008193 yellow 500 ft.
YB1000 008209 yellow 1000 ft.